Valentine’s day is just around the corner but last weekend was our wedding anniversary and so I had to make a special cake! 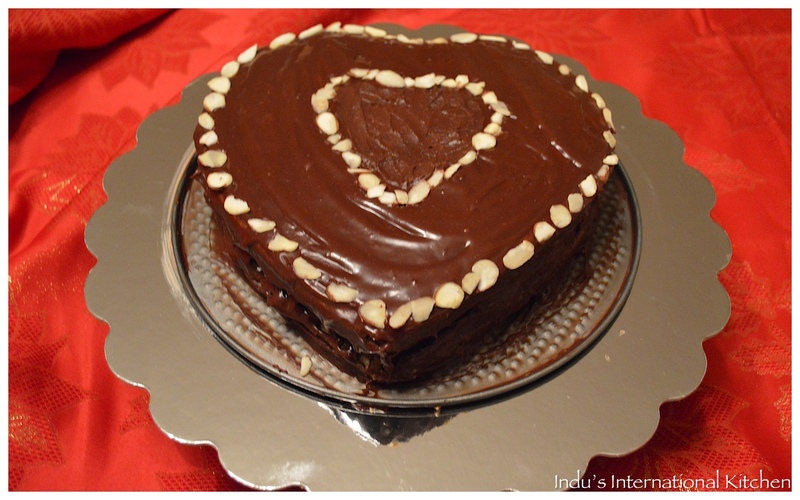 Since hubby dear in general does not love sweets but adores nuts I decided to make a chocolate almond cake replacing part of the flour with almond flour. I actually got the idea for this cake from a book called ‘My Sweet Mexico’ by Fany Gerson in which she shared the recipe for her exquisite 4 layer ‘Mexican Opera Cake’. This recipe was 3 pages long! I am not kidding! But judging by the ingredients and the elaborate recipe, I have no doubt that the cake must taste heavenly! However I did not have that kind of time nor the infinite amount of patience needed to make any exquisite creation of that sort. 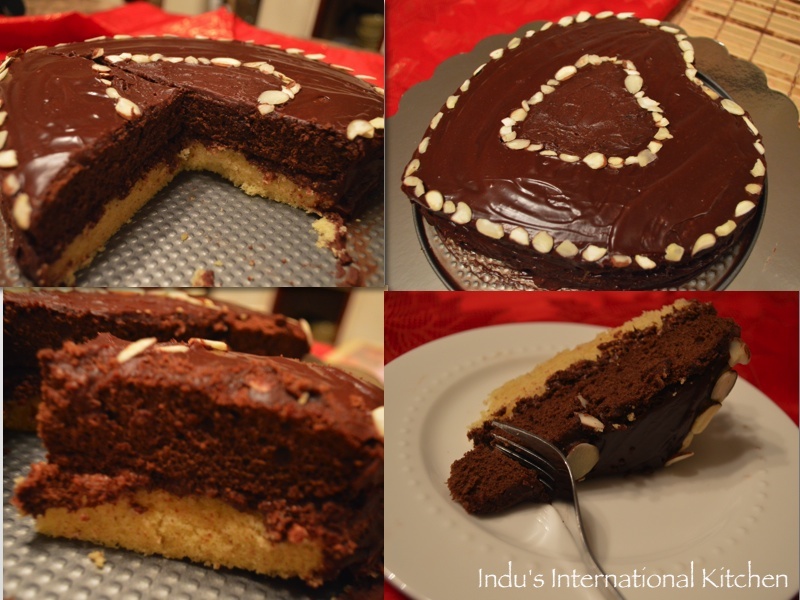 Hence, I read the whole recipe back to back, enjoyed the pictures and then two days later decided to bake this cake using the Opera cake as an inspiration.! Preheat oven to 350 deg F. Lightly grease and flour the pans or line the pans with parchment paper. Keep aside. Mix the all purpose flour, almond flour, baking powder and salt in a large tray or parchment paper and keep aside. In a large mixing bowl, add the butter and sugar and mix with an electric mixer (or a stand mixer) until smooth and then add eggs two at a time and continue mixing until you use up all the eggs. Next add the mixed dry ingredients slowly and continue to mix till well blended. Add the vanilla extract and mix again. Pour half of the mixture into one of the cake pans. Then to the rest of the batter, add the cocoa powder and mix first using a spatula and then again mix using the electric mixer until well blended. Pour this mixture onto the 2nd pan. Remove the cakes from the oven and let cool for about 10 minutes and then slowly loosen the cake from the sides and turn each one over to a plate. While the cakes are cooling, you can make the syrup by boiling the water and sugar for 3-4 minutes stirring to let the sugar dissolve and then add the tequila or brandy. 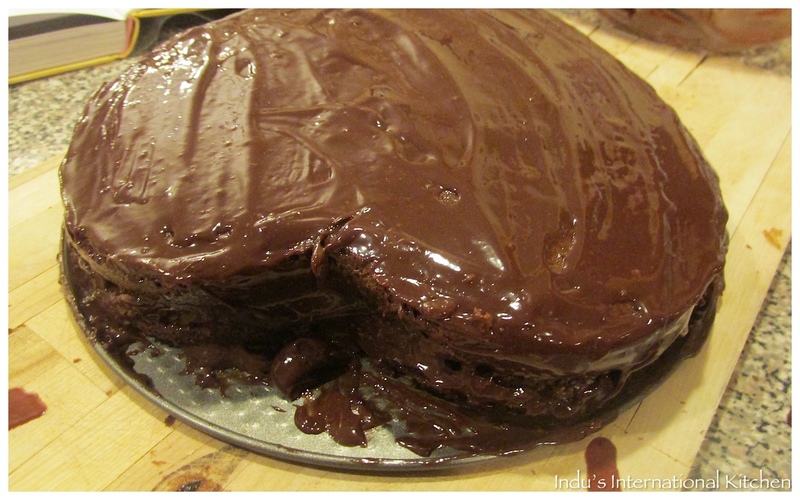 For the ganache, mix the ganache ingredients and microwave for 30 seconds. Then mix well with a whisk until smooth. Keep aside. Drizzle this syrup over the cakes with a spoon to make them well moistened. Immediately place the white layer on your final cake stand or a tray. Next take the rice kris pie nutella filling out of the fridge and place it over the cake – you may need to cut the edges to cover the cake well. Next place the chocolate layer and spread the ganache on top. 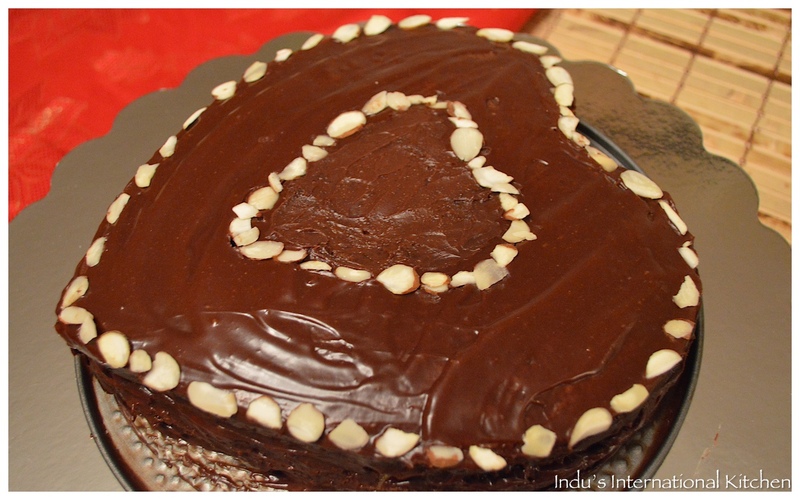 Decorate with sliced almonds! Is this heaven on earth? Will have to try it… I adore Nutella (who doesn’t?!) and the combination of almond cake, rice krispies and nutella sounds perfect! I heart this cake very much. 🙂 Love the combo of flavours, Nutella… Mmmm… It is like one of my all time fave eats, i reckon Id struggle to make this cake, mostly because the key ingredients wouldn’t hang about long enough. There is soooo much about this cake that sounds delicious! Wow Indu!!! Looks super cool…A very different recipe! Whoa Indu ! What an amazing recipe my dear girl :). If you don’t mind me asking, which state are you in? Hi Sonal I am in CT! Freezing here! What about you? ❤️ it would have been fun!